Leigh Talbert Moore, Author: Amazon Goofs, You #WIN!!! Yes, yesterday was one of those days, reader-friends. **Relocated to the Fairhope Public Library, thanks to T.S. Karen. If you're in or around south Alabama, please come out and say Hi! I'll have books on hand for purchase, but you can bring your own for signing. Back to yesterday... So I have to have print copies of my books on hand for this, right? No worries! I ordered them in plenty of time to be here before the trip. The only problem was yesterday they weren't here. OK, they were here, but nobody knew who had them. So I spent all day tracking down three boxes of books. NOW 99 cents on Amazon! These days happen, I guess. And when I'm writer, editor, cover designer, marketer, and enforcer (aka, a self-published author), if I miss something, well, it gets missed. So! To make it up to everyone, I'm leaving Undertow on sale through the weekend. Yes, through Oct. 7, my lovely, favorite book will be on sale for 99 cents. Get Dragonfly and Undertow Today! Don't forget: Watercolor is out NOW! And remember, you can still enter to #WIN a signed print set of all three Dragonfly books, your own signed copy of Watercolor, ebooks, and more! 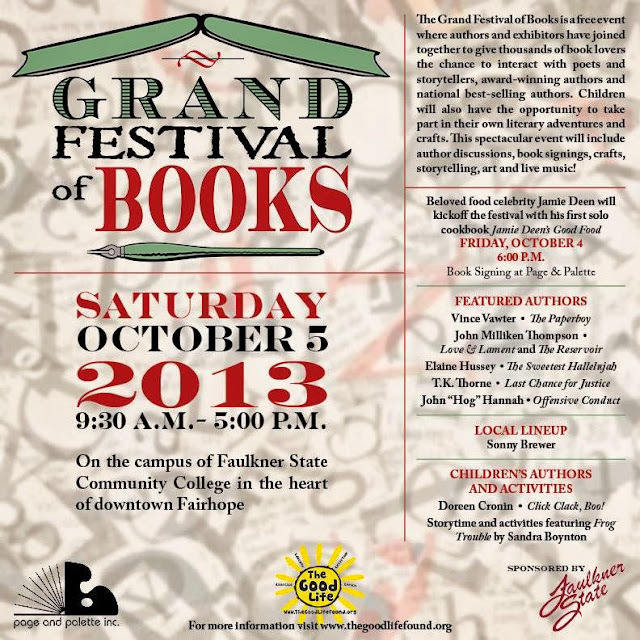 I hope you have a great time at the Grand Festival of Books. Scream for #HALLOWEEN, #WIN a Rouge audiobook! WATERCOLOR--Sales, Giveaways, Tours, oh my! Catchup Sale, Mega Giveaway! Time to #WIN!! !